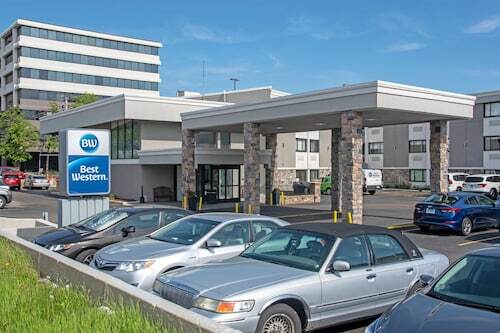 Top Rated Hotels Near O'Hare Intl. 4.0 out of 5.034 m from O'Hare Intl. 3.0 out of 5.02.7 km from O'Hare Intl. 4.5 out of 5.02 km from O'Hare Intl. Had to find a place since my flight was cancelled. Very close to the airport, staff was friendly, booked through orbitz and checked right in. Room was clean, comfortable and cute. Room service was very quick. Shuttle to the airport was a huge plus! 2.5 out of 5.03.8 km from O'Hare Intl. We arrived very early in the morning and were very pleased with the shuttle service. 3.0 out of 5.05.1 km from O'Hare Intl. Front desk staff was helpful and welcoming. Bed was comfortable. The price was right! Morning shuttle driver wasn't too friendly, but my afternoon pickup from the airport was great! 2.5 out of 5.03.1 km from O'Hare Intl. Everything was great!! Very nice staff and room was very clean. 3.0 out of 5.021 km from O'Hare Intl. Very clean and quiet, easy parking good location and good space in room. 2.5 out of 5.017 km from O'Hare Intl. The Chicago O’Hare airport is the second-busiest airport in the country and serviced more than 65 million passengers in 2011. What began as Orchard Field, an aircraft assembly plant, in 1945, has grown to become the fourth-busiest airport in the world, behind notables such as Atlanta’s Hartsfield-Jackson Airport, the Beijing airport, and London’s Heathrow Airport. O’Hare is so vast that Chicago designated it as an official community area sometime in the 1980s, even though no city residents actually live there. O’Hare airport is located in Chicago’s northwest section, just 18 miles northwest of the city’s famed Magnificent Mile. In addition to the typical boutiques, newsstands, and gift stores, more than 65 restaurants offer everything from fast food to unique local cuisine at O'Hare. Travelers have access to WiFi service as well as workspaces with power stations in order to keep everyone connected. 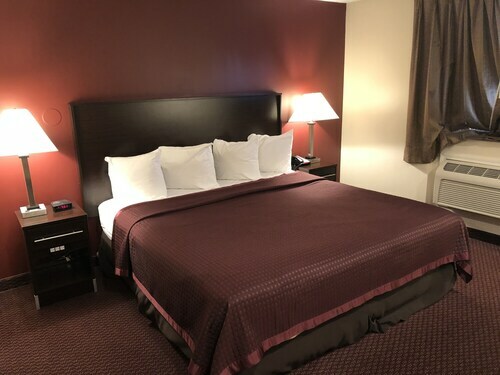 Although the airport only has one hotel on site, a variety of hotels are located within a few miles of the airport's borders in nearby Rosemont, Bensenville, and Elk Grove Village. The airport is part of Chicago’s Airport Public Art Program and plays host to a variety of special events, performances, and art displays throughout the year. Whether you’re visiting the Chicago area or are just on an extended layover, the Chicago O’Hare airport will make you feel as though you’re in a city within a city. Orbitz.com is your home for some of the most affordable rates on flights, rental cars, and hotels at Chicago O’Hare Airport. It’s a new hotel right next to ohare. Everything is new and clean. Staff is polite and helpful. Was there for work, rented a meeting room and it was perfect, didn’t have to go downtown. Rosemont has all the restaurants and entertainment you need. The staff and the property was excellent. I would recommend this place! !